There has been a little confusion about the date of the scans. CJ will have the MRI on Monday October 21st at 4pm. A few people asked me why we didn't do it sooner and if it was a good sign that they were in no hurry. I will give you an honest answer. When I called to make the appointment they offered me the very next day and a few others the same week. As I sat there looking at my calendar trying to find an open date, three (selfish) thoughts went through my head. First selfish thought: CJ has already given up enough for cancer. I won't do it on a day he wold miss something important to him. His schedule was full with things he loved. Third selfish thought: If my life is going to change..... I am not ready until next week. How's that for good reasoning and planning? "Are you worried?" seems to be the question of late. Yet, for the first time, thanks to the follow up questions and conversations, I realize we all define worry in different ways and I am not always being asked the same question each time. Some of us define worry as experiencing fear of what might happen. Some of us consider worry when something is consuming our thoughts to the point we are unable to concentrate on anything else or think positively about it. Some of us define it as being anxious. Look up the word worry and interestingly you will find many different definitions. Worry is thoughts, images and emotions of a negative nature in which mental attempts are made to avoid anticipated potential threats. As an emotion it is experienced as anxiety or concern about a real or imagined issue. Most people experience short-lived periods of worry in their lives without incident; indeed, a moderate amount of worrying may even have positive effects, if it prompts people to take precautions or avoid risky behavior. Excessive worry is the main component of generalized anxiety disorder. I just love the "mentally attempting to avoid anticipated potential threats" part. I don't know about you but my mental state and thought life is the least trusted part of my entire being. My thoughts are selfish (as demonstrated above), corrupted by my deceitful desires (Eph 4) and overwhelmingly negative and just plain wrong most of the time. That is why we are told to renew our minds. (with Scripture) I think this sentiment is right up there with my other favorite expression of "Following my heart" as if it can be trusted. I tried that a couple times too. Didn't go so well. So trusting my mind to protect me surely isn't going to happen. My other favorite part of that definition (more sarcasm) is "worry may even have positive effects if it prompts people to take precautions". You just gotta love when something God plain out said, Don't do! Like ever! suddenly becomes something that can have positive effects in our lives. I agree there are some things God said you can and should do in moderation with wisdom like; eating, drinking, exercising, working, and enjoying the fruits of your labor. But I can't find that said about worry anywhere in the Bible. My definition of worry is much shorter. I define worry it as: "Not trusting God". So if when I answer you,"No, I am not worried," you hear......"I don't think it will be cancer this time, or I haven't even thought about it too much, or I am not anxious about all the changes this could bring, or I have spent no time thinking about the what ifs and consequences of relapse That is not what I am saying. I am saying: No, I am not worried. I trust God with the result. That said, many have asked how you can pray for our family and CJ as we wait and prepare for this MRI and the results. I would say pray however the Holy Spirit leads you. If you feel strongly to pray for negative results, please do. If you feel strongly to pray for wisdom for the doctors and those reading the scans, please do. If you feel praying for CJ's continued healing, please do. 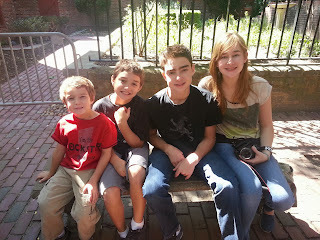 If you feel strongly to pray that God would grace my kids considering the mother they have, PLEASE DO! "I pray for the result to be whatever would bring You the most glory in our lives." I shared that I was praying this with CJ after he overheard me answer the question "Are you worried?" to see how he would react. And he said, "Wow, that's cool. Now, no matter what the results you will know God answered your prayer." "Who of you, by worrying, can add a single hour to his life?" Note: (so far) as stated above is my clause for "subject to change if the Holy Spirit allows". I am not that Godly. Just bound. I guess this is my go to place when it comes to all things CJ and needing prayer. CJ went in this past Monday (October 7th) for scans. These were not exactly routine scans since he is now at the point that he only goes to the oncologist once every 6 months for blood work and a physical. However, at his last physical, which was about a month ago, he was having some back pain and the doctor decided to order a CT scan to be on the safe side. The doctor actually said, I really don't think anything is wrong and the odds are it is not a relapse but I know how hard it is to look at a cancer mom and talk about odds and her take me serious to any real extent after how many times she has been told by doctors 'it is nothing'. I liked that he acknowledged that. So the scans was on Monday afternoon and by Tuesday I got a call from the doctor. He began by saying that his back looked good and the original tumor site at his spine had no signs of disease. He also said there was no disease present in the kidney, liver or stomach. All those organs looked healthy and normal. Praise God for that! BUT he entire time he was talking I could sense the "BUT" coming. But is not usually a good thing. Unless you are reading Scripture! Then BUT is the most beautiful word you will ever read. It is actually my favorite word in the entire bible because it is always a word that brings hope and answers not confusion and fear. But not this time. This time the "but" actually turned out to be the spleen. The doctor said "but CJ's spleen presented with some concerns." I won't use the fancy medical terms but needless to say, the doctors and radiologists decided that it is best to go back and do more detailed scans to rule out recurrence of disease and see what is going on with the spleen. I will say that they don't seem overly worried. Just cautious as they should be. Therefore, CJ will be scheduled for an MRI in the coming days as a follow up to his CT scan. The timing of this turn of events was actually interesting to me because CJ literally just completed his two year commitment as the National Youth Ambassador to Hyundai Hope on Wheels. 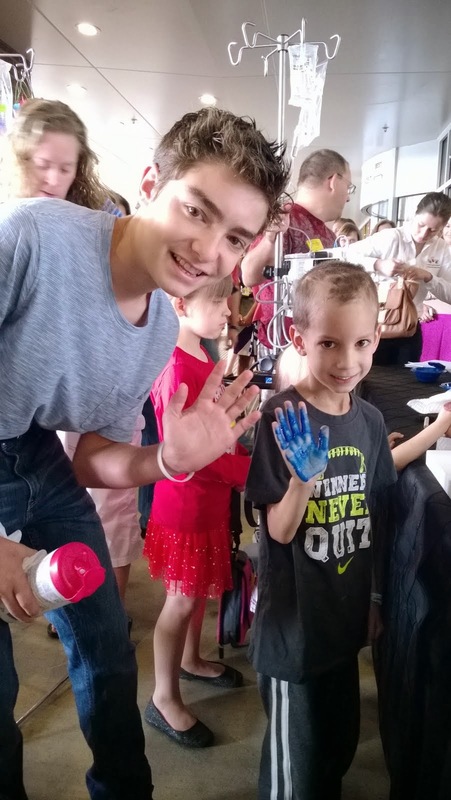 He has spent a good part of the past two years of his remission traveling the country visiting children's hospitals to share his story and bring hope to families in the world of pediatric cancer. 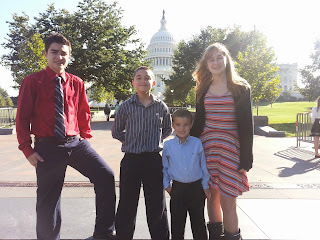 September was particularly busy with several trips all over the country culminating with a trip to Washington DC to speak at a press conference on Capital Hill for National Pediatric Cancer Awareness Month. He met several congressmen and women dedicated to the cause. And he shared the podium with the Korean Ambassador to the United States, Sung Kim. When the Koren Ambassador looked at him and said, "CJ, we are fellow Ambassadors," I don't think CJ could truly grasp the significance of that moment and how cool it was. He did a great job with his speeches and we are extremely proud of all the hard work he has done to continue to push forward the cause of pediatric cancer awareness and funding. He worked really hard on speeches and sacrificed his personal time for something bigger than himself. All that sacrifice has been multiplied into incredible blessings. 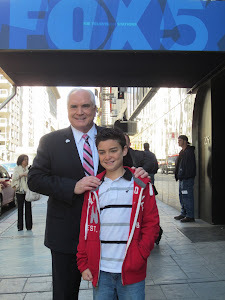 He has had so many neat opportunities as the National Youth Ambassador for Hyundai including speaking twice on Capital Hill in DC, visiting NY City for events and interviews, appearing on FOX News, ringing the closing bell of the NASDAQ in NY City, speaking in hospitals from coast to coast, interviewing celebrities in California that are supporting the cause, starring in a national commercial for pediatric cancer awareness, and most importantly meeting some really incredible kids fighting cancer all over this country, many of whom he still keeps in touch with through the world of social media. There is so much to share on that end but if I start now, this blog post will get really long really fast. So for now, I ask for prayer for CJ as he continues the fight..... his own personal fight to stay in remission as he faces these scans and his continued fight for the cause. So as I leave you praying for our "but"...let me also leave you with some of my favorite "buts" which is where we will be camping our thoughts and prayers in the meantime as we wait. "CJ, you have cancer not a broken leg! Get up and come out of your room and do your school work." I actually used to say that when CJ was on chemotherapy. Did I want to let him lay in bed and feel sorry for himself and just rest his body and distract his mind with video games? Sure! Sometimes. Many times. But I knew it wouldn't serve him in the long run. And I always treated him like the cancer would one day be behind him and whatever was left, no matter where that was, is what mattered. His character. His obedience. His spirit. His education. His future. But man was it hard at times. When you see your child laying literally broken physically and you want to do anything to make them feel better right that moment, you don't think about years from now. You just want to fix it then. I remember very early in his diagnosis coming across another mom that was at the end of her son's long treatment. She was in what we call the 'post treatment phase' when there is no chemotherapy but constant check-ups. I had two years ahead of me and she had two and half years behind her. Her son was about CJ's age and I thought, now this is the perfect person to ask advice, so I approached her. "What advice can you give me as a mother as I begin this long journey?" I invited. She hesitated. She looked at me. She really looked at me. I could tell she was weighing her response carefully. I thought, This is going to be so deep and so helpful. I prepared my heart. She looked at CJ. She looked at her son. Then she turned to me and said flatly, "If you raise a cancer brat, at the end, all you will have is a brat." Needless to say it was not at all what I was expecting to hear. And it wasn't the profound advice I was bearing up to digest from a mother who just completed two and half years of chemotherapy with her son. So I just nodded as if she had said something extremely helpful, murmured my thanks, and walked away. Unexpectedly, her words stuck with me. I knew by the look on her face it took her guts to say and she thought it was important. I began observing all the other families at the hospital and found myself looking for this 'cancer brat syndrome'. It wasn't hard to spot. I suddenly realized what this mother was trying to say. I needed to focus on his heart and not just react to his illness. Even though I realized it was up to each family to decide how they wanted to handle their own parental fears, guilt, and remorse over their child's illness and pain, I knew I had an important choice to make and that somehow it would have lasting consequences. I was thankful this mother challenged me to think beyond the present. In the end, or rather beginning, thanks to these unexpected words from a wise mother who had been in my shoes and as a result of a lot of face time with the floor in prayer, I chose to focus more on CJ's character than his cancer. I chose to care more about the state of his spirit than the state of his health. And I chose to prepare him for a future with the Lord Jesus Christ, not me. If you read this blog you know very well that I did it imperfectly and failed miserably at times but I fought to keep me eyes fixed on the goal.... life eternal not life temporal. It often translated into the statement above when CJ was in bed and pushing the limits of chemotherapy's effects if you know what I mean. "Your legs aren't broken CJ! You have cancer. Get up, make your bed and get to work." That was four years ago and I haven't said that in over two years. Then, today, in some strange twist of fate, I found myself saying, "CJ, you have a broken leg, not cancer! Get out of bed. Get to work and stop feeling sorry for yourself." I almost laughed out loud when I realized what I had just said. You have probably figured out by now that CJ broke his leg. Badly. 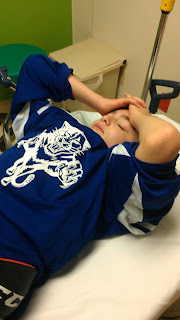 He was playing hockey in his game last Saturday when he took a hit and went down. Thankfully, the referees and the rink he skates at handled it perfectly and knew to not move him and called 911. An ambulance came and took CJ to Joe DiMaggio Children's Hospital. In another weird twist a fate, I found myself sitting in an ambulance thinking about how I always regretted not being able to ride with him to the hospital in the ambulance when he was first diagnosed. And yet here I was 4 years later listening to him scream in pain and regretting that I chose to ride with him instead of in the protected silence of the car behind. It has been a tough break for him in more ways than one. No pun intended. 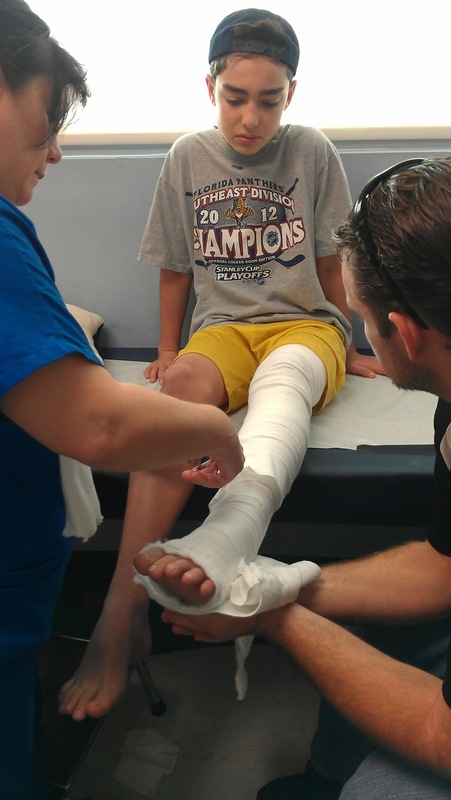 The break itself requires a full leg cast which is extremely limiting and cumbersome. The pain has been pretty constant up to this point. He was actually beginning to make progress with the mobility and pain until we went in to see the doctor for the one week follow-up and x-ray. They discovered his bone had shifted so they had to cut open his cast, reset the leg, jam some sticks in there to hold the bone in place, and then recast around it. It hurt. A lot. So CJ is frustrated. Not only because he has a broken leg but because he has a broken heart. He fought so hard to get where he was. Healthy. 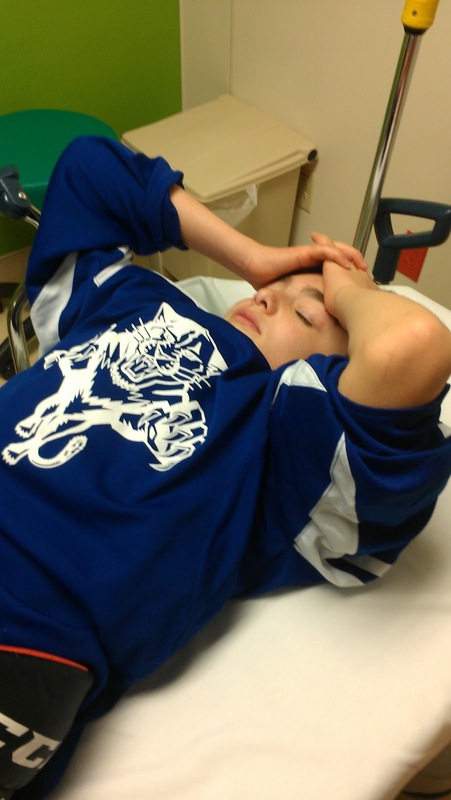 Physically ready and able to play hockey. He played two seasons at two levels below his own age and worked so hard to get to his own league level. He had finally made it this season and was loving every minute of it. Then this. In an ironic twist of fate I asked Someone, "What advice do You have for me in this situation?" And He said, "Focus on his broken heart not his broken leg." Funny, how it sounds very similar to advice from not so long ago, just worded a little more eloquently. So once again I choose to focus more on CJ's character than his physical ability. I chose to care more about the state of his spirit than the state of his mobility. And I choose to prepare CJ for a future with Jesus Christ, not hockey. Life eternal not life temporal. 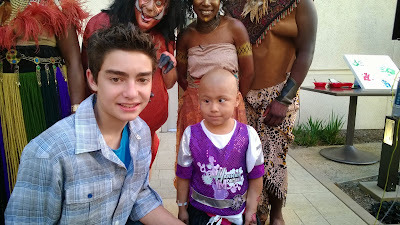 Today CJ walked in the door of the pediatric oncology clinic for his blood work and physical exam. As the oncologist examined him I noticed strange things. Like how far his legs were hanging off the examining table. And how the doctor wasn't really much taller than CJ anymore. And how confident and comfortable he seems in such a stressful environment where kids are treated with serious and life threatening illnesses. But that's not what I was there for. I was there to see if CJ's blood work revealed what I already believed to be true; that he is still in remission with no serious signs of relapse on the horizon. Praise God, it did! The oncologist ordered a heart sonogram which will hopefully take place in the next couple weeks. This is to monitor how CJ's heart is handling the "late effects" of the chemotherapy he received during his treatment. Sadly, many children survive their battle with cancer only to succumb to heart failure or damage to other organs as a result. There is nothing more sad to me than the child who beats this beast only to pass away because their little body can't handle the cure it was offered. 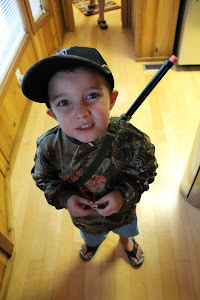 I always told CJ he would have to fight the disease and fight the cure at the same time. Now we are only fighting the cure and so far CJ is winning! Thank you to everyone who prayed for the results today. Please say a prayer of thanksgiving with us for this report and pray for CJ's heart to be strong and filled with nothing but the Holy Spirit! 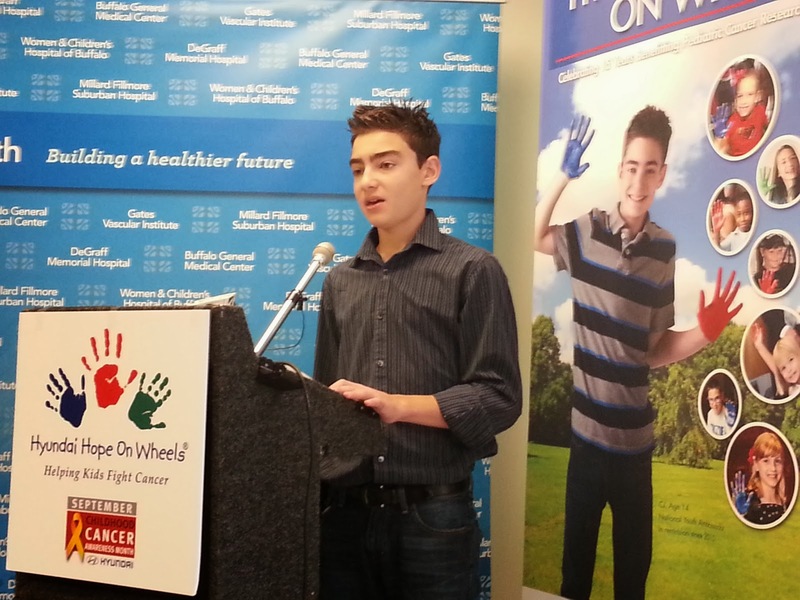 CJ has been fulfilling his duties as the National Youth Ambassador for Hyundai Hope on Wheels. The National kickoff in NY city was amazing and he did a great job. He is continuing to support the Leukemia and Lymphoma Society a a representative and spokesperson. He recently gave the keynote speech at the Man Woman of the Year Gala in Ft. Lauderdale for LLS as the Boy of the Year. I will be posting a copy of that as soon as I am given one as I really want to share with you what God is doing in his young life. In addition he is committing to another season as the Ambassador/Spokesperson for the Florida Panthers Foundation. He is really growing in this area and I would ask for prayer for this phase of his life as he seeks to be humble and use the platform God has given him for however long God allows him to have it. On a personal note, I want to apologize for not being faithful with the blog and posting CJ's post treatment endeavors. I have to be honest and confess to you that it was easier when he was sick to share what was happening in his life and use the blog to beg God openly for mercy and beg you all for prayer on his behalf. Now that he is on the other side of treatment, I have struggled with sharing his success for two unnecessary reasons that God has recently convicted me of. One reason I struggle with updates is that I have so many friends who don't have a "success story" to share and it burdens my heart and interferes with my thoughts as I post updates so I often find myself deleting them and not posting. I can't explain it in any way that will make sense other than the term 'survivors guilt' which I don't have but I can't think of a better term to use to define the struggle. It is more like 'survivors mercy' that I struggle with. What I have learned is that these very families want to hear how CJ is doing and rejoice with me in his continued healing and success. They don't resent our survival. The want to hear how CJ is making a difference in the world pediatric cancer and I was robbing them of that. Thank you for the faithful parents who bravely shared this viewpoint with me. The second reason I have struggled with posting is the fear of not coming across as anything but humble and grateful. But God has convicted me that this side of treatment highlights HIS glory as much if not even more than when CJ was on chemotherapy. God has shown me that this side was part of HIS plan all along. We are not making it up as we go. CJ's continued healing and successes are to God's glory. His ability to share his story in powerful ways that affects people and creates change is all by the grace of God just as his healing each day during treatment was by the grace of God. It was wrong of me not to share this with all of you who followed and prayed faithfully. I do realize that many readers of blogs like this fall away when the "tragedy" appears over but I realize that is to their loss not ours. As parents, we are extremely proud of CJ's willingness to share his story. It is not easy for him by any means. I truly believe the enemy wants to silence him just as he always has. We live with him and we watch the struggles he faces and the way the enemy and his flesh try to attack him. Then we get to see the fruit of his obedience when he shares his story or his faith and we witness others "see his good works and glorify God". That is where I realize I failed with all of you. I have not given you the opportunity to see or share in CJ's good deeds and the fruit of what God has done and glorify God with us. I believe your prayers were instrumental in CJ's healing and therefore CJ's good work is as much your success and the good fruit of your prayers bringing glory to God as it is ours or his. Many of you have shared with me that you prayed that God would not only heal him but would use him. These are your prayers being answered. In addition, from things I have witnessed recently, I have come to realize that CJ needs prayer for this season of his life more than he ever did when he was sick and in the hospital. There is nothing more difficult than sharing your faith and walking the fine line of "being tested by the praise of man", or the enemy convincing you that you are disqualified from sharing your testimony. Therefore, I am not ashamed to ask for whatever prayers I can get for my son. Of course I love all my children and pray for them all but I have to be honest, I have never seen anything like the struggles and attacks CJ has had on his life so I will unashamedly beg for prayer in that regard. As parents we are extremely grateful for the role models and friends God has placed in his life. CJ was able to spend the last three days with his mentor and friend David Booth who is a professional hockey player in the NHL. But that is not why CJ loves and admires him. CJ admires his love for Jesus and openness and passion about his faith. 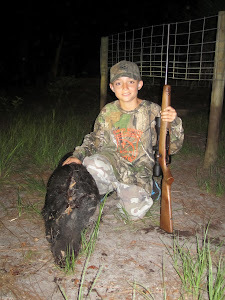 CJ and David got to spend quality time together these past three days at a Ranch in Florida owned by one of the most amazing families we have ever met who also had a huge impression on our family and faith. Much of that time for CJ was spent in a hunting stand or in a small hunting blind where David often encouraged CJ in his faith, in the Scriptures and in his speaking. David reminded CJ that he has to use this platform that God has given him faithfully for however long he has it. Thank you David for investing in CJ in this way. Not just with your time, talents and treasures but with your words. You cannot know how perfect the timing was for this in CJ's life and current struggles. Everything you did for him was special but nothing means more to us than the words he tells us you shared with him and the encouragement you gave him to trust, follow, and obey God at all costs. And thanks for sharing the Arruza family with us. What a priceless gem they are! I believe I threw a little teaser out there on my last blog that I had some exciting news to share with everyone. Well I can't wait anymore. I decided that I am going to let you in on the secret a few weeks early. The official announcement of what I am about to share with you doesn't go public until April 5th but I know I can trust my faithful blog followers to not post this news on facebook or anywhere else until April 5th!!! As many of you already know CJ has served as the Ambassador for the Florida Panthers Foundation throughout this past NHL season. That relationship developed over the previous year as CJ served as their Honored Hero for their Light the Night Team. 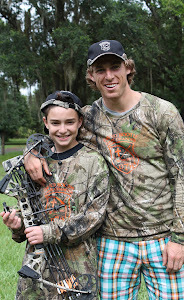 The Florida Panther Foundation is committed to supporting the pediatric cancer community and so are we so let's just say CJ and the Panthers make a great team and because of that they extended him the invitation to be their first ever Ambassador to represent their foundation's mission. As such, CJ participated in the foundations signature events. He was the keynote speaker at their Face Off Gala, was a part of the auction at the Ice and Dice fundraiser, did hospital visits with a player, and served as a junior reporter at the Foundation Golf Tournament. 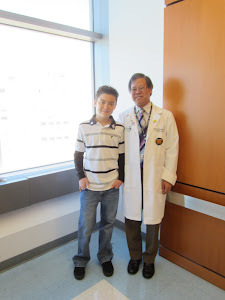 Then, a couple months ago I received an email from CJ's oncology clinic. In short, they were encouraging me to submit an application for CJ to serve as the National Youth Ambassador for the Hyundai Hope on Wheels program. They felt CJ would be an perfect fit for this position and already had experience because of the FL Panthers. I was already familiar with the Hope on Wheels program because CJ had participated in local events when Hyundai came to South Florida during his treatments and I already knew I believed in what they are doing. In short, they grant millions of dollars to children's hospitals, clinics, and researchers across the country every year for pediatric oncology. I read about the position and learned that the youth ambassador position lasts two years and includes traveling with the Hyundai Hope on Wheels team across the country speaking at events, hospitals, Hyundai dealers and even in Washington DC. It is a huge commitment and an even larger opportunity. After receiving the email, I read more about it, prayed and entered CJ as an applicant for the position. By now, you probably know where all this is leading. YES!!! After a national search, Hyundai has selected CJ as their NATIONAL Youth Ambassador for their Hope on Wheels Program for the next two years. They called and extended the invitation and supplied us with even more information to help us consider our answer. After a family meeting and honest discussion, CJ accepted the position. He knows this is a huge commitment but feels like God has opened this door to this next step for him. Hyundai is not just interested in using his face on a billboard and his story as they travel across the country. They want his voice and his message. He will be traveling with them, speaking, encouraging and motivating both kids battling cancer and those involved in the Hope on Wheels program. Interestingly, we also met with the Florida Panthers Foundation who wrote a wonderful letter of recommendation for CJ for this position. They also plan to keep CJ as their ambassador for the future season and are thrilled about his position now as a National Ambassador. Their support and encouragement means a lot to us. 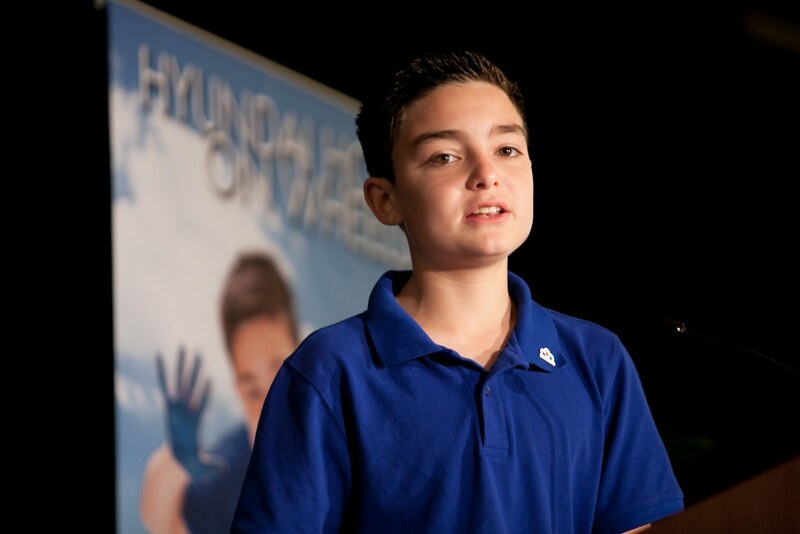 As a result of his acceptance, last week we traveled as a family to California to the US Hyundai Headquarters where CJ delivered an introduction speech to the 350-400 Hyundai employees. He did amazing and we are very proud of him. If you have ever done any public speaking on any level I think you can relate to how nerve wracking, anxiety filled and emotionally draining public speaking can be. CJ has become more and more comfortable with this is the past two years as he has spoken at many many events from corporate meetings to large Gala's, schools and churches. But this was definitely the farthest he has ever traveled to speak and since this is a National position we know it is going to come with its own set of new challenges. So here is the neat part and the big reveal. It is also how I knew God was 'in this' and pleased with our decision. I often ask for clues or a little sign of confirmation in my spirit or visually that will help me know we are on the right track and that God has covered it with His blessing. This is how I believe God chose to do that for me in this situation...... April 5th is CJ's 13th birthday. Well, April 5th also just so happens to be the the exact day that Hyundai goes public with their announcement at the New York City International Auto Show. They have invited the whole family to come and participate and CJ will speak at the event. After that, the show literally hits the road between April and September ending full circle back in NY City at the very end of Childhood Cancer Awareness Month. During those 6 months, CJ will commit to traveling and speaking in a minimum of 6-8 cities throughout the country representing the Hope On Wheels Program and sharing his story. And then do it all over again next year to all new cities. So that is the big and exciting news. I just couldn't wait for it to go public to tell everyone. Once it goes public we will begin sharing more and posting updates and information publicly on facebook as will the Hope on Wheels campaign. 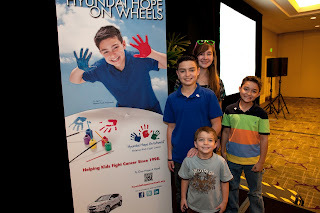 On April 5th all their Hope on Wheels material will switch from their previous Ambassador over to CJ. All Hyundai dealers across the country will have his picture and materials in their stores. But most importantly, CJ will be sharing his story of healing and hope with hundreds of kids across the country battling cancer encouraging them in their battles. Thank you for letting me share this exciting news with you. What I would want most is that you rejoice with us but that if you are willing you continue to cover CJ in prayer for this next season. He has not shown an interest or asked to stop sharing his story although many kids do after such long treatments. He seems to realize it is important and that... to whom much is given, much is expected. CJ knows he has been given much. Secondly, I would ask that you keep in mind what the Lord has done here. Don't look at CJ and think, Wow! what an amazing young man. Look at God, and say Wow! What an amazing God we serve. REMEMBER...CJ was an anxious, shy, panic ridden, and extremely sensitive young boy before he was diagnosed. He also spent much time in speech therapy because most people could barely understand him. It was frustrating and if anyone told me then he would be a powerful public speaker effecting people's lives at the age of 12 I would have laughed pretty boldly and confidentially in their face. God has used a serious trial to transform and mold him into a young man with a message and equipped him to share that message. No, He hasn't removed the fear or the anxiety but taught CJ how to deal with it and lean on Him for strength. That's not to say the old enemy doesn't come calling. There have been a few moments where I would have went toe to toe with the devil to get his hands off CJ if God would have only removed the veil so I could actually see him to get my hands on him. Obviously, God knew that wasn't such a great idea and my protective angry mommy heart was feeling a little more brave than it rightfully should with a request like that. Those reminders are good I suppose because no matter how far CJ has come, I still stand amazed every time I sit in a room like I did last week and see CJ take the podium and deliver a well spoken clear and powerful speech. I don't see CJ standing there. I see an amazing God. I pray you do too. And remember....Shhhh!!!! Until April 5th! CJ had oncology appointment this week. He had full blood work and a physical check up to continue to monitor his progress off treatment. We are grateful to announce CJ remains cancer free and in full remission. Praise God... "in a loud voice." I especially liked the comment his doctor made as she examined him that went something like this, "The further he gets out of treatment, the less likely he is to relapse." That is great news of course but I caught myself thinking it like this, "The further he gets out of treatment, the more likely he is to forget." Complete physical healing is a tricky thing. Complete healing often means there are no recognizable outer marks that distinguish you from anyone else. No one will look at CJ and say, "Wow, look what God has done," because he looks like any other kid his age. I am not trying to be insensitive. I am extremely thankful that God chose to heal CJ without further complications and I know many of my friends whose children have amputees or some other physical evidence as a result of their treatment would probably trade places with us in a second. However, I can't help but feel like the evidence of what God has delivered them from is always present and a constant reminder to them and at the same time speaks as a loud testimony to others who encounter them. CJ's testimony is in his heart and mouth. 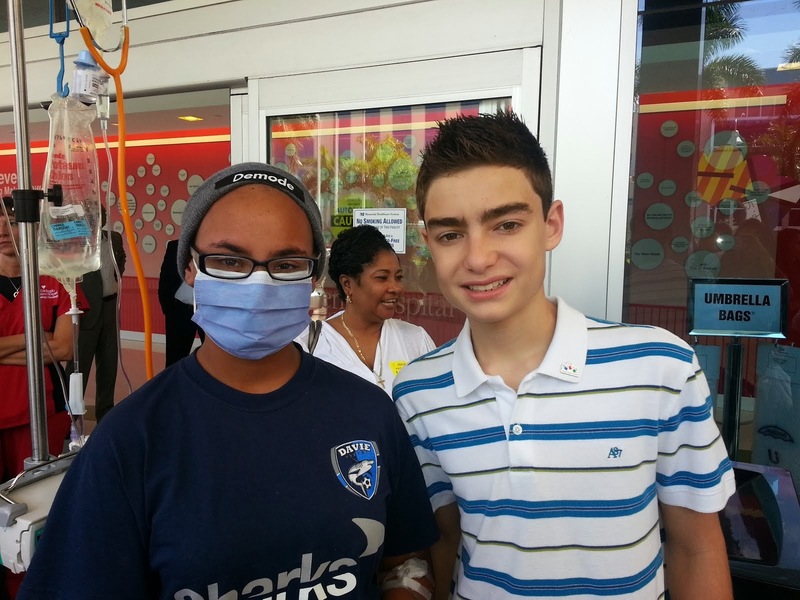 I met with another mom this week whose son went through treatment for Lymphoma with CJ. Like me, she struggles with this new phase of life after cancer as if it never even happened. She was at his flag football game earlier that morning and she described the struggle of standing there on the sidelines watching and knowing what a miracle she was witnessing and how it has impacted their lives and yet there is no physical evidence of what they went through as a family. She finds it hard not to talk about it and share it with the other moms watching the game. I could relate to everything she said and the post treatment struggle she was dealing with. And it makes you wonder how many miracles we witness everyday we never even notice. So it has me thinking. Why are some struggles we face left with physical evidence like Jacob who walked with a limp after he wrestled with God and others like Paul who had a thorn in his flesh to constantly remind him of Gods grace on him, while some just take up their mat and walk. If you never encountered the blind beggar before he was healed you would have no reason to glorify God upon meeting him, unless he shared his testimony with you. Then this morning I was reading Luke 17 and something new jumped out at me. Jesus healed ten men of leprosy from a distance. This appears to be a complete physical healing from a very obvious outer affliction. Upon receiving the healing only one of the ten men returned to Jesus praising God "in a loud voice" thanking Him. But that statement "in a loud voice" seemed out of place and important. Why "in a loud voice?" Jesus could hear him perfectly well. Furthermore, we know now that Jesus could hear his thoughts and knew them before he even thought them so why was it recorded for us that the man returned and praised God, "in a loud voice?" Why is that there in this account of the healing? As I sat there pondering this I felt like God was saying it wasn't about Jesus. The man wanted others to hear. For me it was significant because it reminded me that although we don't have any physical evidence of the healing CJ received that would stand out to others, we do have a loud voice. That loud voice is for the benefit of others not Jesus himself. Jesus hears the volume of my heart no matter how loud my voice is. My voice is a testimony to those that overhear and give glory to God. Tonight is our first meeting for the Man Woman of the Year Campaign for the Leukemia & Lymphoma society for which CJ has been asked to represent the campaign as Boy of the Year alongside a very special Girl of the Year named Hailey. This is a fun campaign where men and women race to raise funds through events and donations during a set time frame. The top male and female fundraisers are named Man and Woman of the Year at an exciting Gala that ends the campaign. Tonight I will share our family's story at kick off and CJ will speak "in a loud voice" at that Gala. I pray it echoes loudly reminding him and others of what God has done. "One of them, when he saw that he was healed, came back, praising God in a loud voice. He threw himself at Jesus' feet and thanked him." There weren't any spare moments or else I would have updated this blog! Probably the most significant change for our family since I updated last came in October when my niece Jerri-lyn, who had been living with us for almost 16 of the last 24 months, was reunited with her mother. As the court ordered, we drove Jerri and her brother back to Gainesville, unloaded all their possessions, and said our good-byes. As we drove away, I had a pit in my stomach but complete peace in my heart and mind that this was completely God's plan for her. I am so proud and thankful to say that my sister is doing amazing and becoming an excellent mother. With God ALL things are possible. That change was significant for our family in that once we returned home we realized it was the first time we were together as a family unit in over three years without any crisis pending. CJ was in remission and completed treatment, Poppa Enzo had passed and was no longer suffering, my girlfriend was cancer free, and Jerri-lyn was reunited with her mom. As a result, I guess you could say we........overreacted! It was like we were kids let loose in a candy shop after staring at the goodies that were off limits for far too long. We immediately took some trips, hit some theme parks, went camping, and felt free to come and go without checking first with doctors for CJ or social workers for Jerri-lyn. It was an unfamiliar but good feeling after three years. Then the holidays bore down on us way too quickly. Thanksgiving was spent in Virginia, Christmas was a blessed mess, and now it's 2012. How did that happen? Like I said, it's a blur. But a blessed blur! I had to keep reminding myself of that when I was overwhelmed, frustrated or resented the craziness of the season. It doesn't take much to remind myself how fortunate my blessed mess was though. I thought of my friend who was spending her first Thanksgiving without her son. I knew they had not even sat at the dining room table since he passed several months before because they could not stand to look at his empty chair. How would they eat Thanksgiving? I thought about sweet Madelyn who passed away Nov 26th after a long and rigorous battle with cancer. Her funeral was one of the most meaningful things I experienced during the entire holiday season. I saw Jesus more at that funeral than I did on Thanksgiving and Christmas combined. Why is that? I thought of my friend who lost her son just before Christmas in an unexpected tragedy I was all too familiar with. I hated that I could identify with her pain and yet at the same time I was so thankful that I could. Focusing on all those things helped me get my focus on Christ. He wasn't just a baby in a manger for me this season or someone I gave thanks to before a ridiculously abundant meal. He was the One who sat in the empty chair that Thanksgiving and comforted my friend. He was the One we saw as Madelyn's mom and dad spoke at the funeral and shared how she lead them and so many others to Christ during her battle. He was the One holding up my friend after a loss that should have crushed her, providing a peace the world marvels at and we can't even comprehend ourselves. So here we are in 2012. I can't help but wonder where I will see Him here. I know it won't be where I expect. So far this new year, CJ remains in remission and goes to the oncologist every two months for blood work and a physical. Every time he gets a clean bill of health....I see Jesus. He is still playing hockey with his little brother Brett and they enjoy every minute of it. Every time I see him glide across that ice....I see Jesus. He recently filmed a commercial for the Joe DiMaggio Children's Hospital and he continues his role as the Ambassador for the Florida Panthers Foundation. His role as such has been to speak at events, raise awareness by sharing his story, and put a face to the mission of the foundation. Every time he stands up a speaks at an event..... I see Jesus. He will be doing a hospital visit with the players and he is gearing up for the St. Baldricks event in February where he will be shaving his head alongside some of the Panthers players. This is a big deal because the last time he was bald he had no choice in the matter. He knew it said something about him. Now, he chooses to shave his head to raise awareness and it is him saying something about it. I have a feeling when I look at his shaved head... I'll see Jesus. 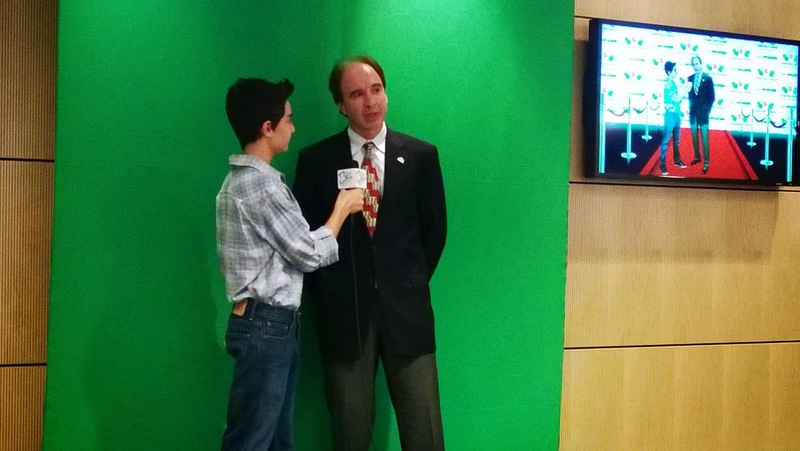 His work as the Florida Panthers Ambassador will be featured on a televised spot called Inside the Panthers. I will try to let everyone know when it will be on. I am really proud of all that he has accomplished and how he continues to give back to the community. He has an amazing opportunity on the horizon that I can't wait to let everyone know about once I have a little more information. So keep posted and check back soon. In the meantime happy new year to you. I pray it is a blessed mess and that you see Jesus in the least expected places. CJ went in for his one year OFF treatment check up this week. This may sound silly to you but this was a huge milestone for us and definitely for him. You may remember the appointment when the doctor shared with us that, "The first year off treatment is the most critical for relapse." It was one of those things that you wish you didn't hear because once you do you can't seem to get it out of the back of your mind. After the results were in, the doctor came pulled up the blood work on the screen which includes at least 6 different markers including white blood cells, hemoglobin, platelets, neutrophils, etc. He began reading them off and stated, "Everything looks great!" He told CJ they were all "normal". Now keep in mind that CJ is used to having blood work that is 'normal' for him, or 'normal' for what he is going through, or 'normal' for a cancer patient, or 'normal' whatever stage of treatment he was in so I thought it was quite cute when CJ asked him, "So is that normal for me or is it just normal?" The doctor replied, "This blood work is normal for anyone." Praise God....CJ is now a 'normal anyone' again! At least according to his blood work, which is about the only place I want him to be a normal anyone ever again! So what has changed as a result of this great news? Based on the original statement I would say it is safe to assume that CJ's percentage of relapse decreases after the first year off treatment. In addition, CJ will now go in for blood work and a physical every two months instead of every month. Those are great changes and we will take them. Thank you Lord! As I walked out of that hospital with CJ that day, and we waited for the car, I found myself trying to picture us walking in and what we were like three years ago. I have to be honest, I don't even recognize those people anymore. I could not help but wonder what they would be like today and where they would be if the last three years never happened. It was like I was imagining someone else's life that I once knew. Sounds crazy I am sure but I am just the reporter of what this strange mind concocts. What struck me as extremely powerful was the sheer vastnass of all that has happened to our family in the three years between CJ's diagnosis to CJ's final port removal. I was sort of frozen with the thought of it all. I was sharing this with my mom later and she said, "That is why we don't know the future." That simple statement has really stuck with me all this week. I think of all the times I have said, I wish I could go back and do it over knowing what I know now as who I am now. Actually, I said that as recent as this week to a friend who is in her own battle with cancer. 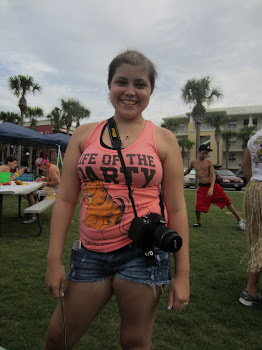 But to be totally honest, when I think back to my absolute worst day in all this, the day that I felt most crippled and terrified by all of this was the day the doctors and the chemo counselor sat me down to 'prepare' me for what the next two years of my life would look like with CJ on treatment. It was the day I crumbled. I was terrified. I felt helpless. I felt hope drain and could not get a grasp on how we would get through the next two years of chemo. Just hearing all that was "going to happen" was devastating. Can you imagine if she would have also said, "In addition to all of that that you are going to lose your father who you have just gotten extremely close with again, you are going to lose your step father and hold his hand as he passes, you are going to gain and lose a Godchild you will adore and hold her little hand as she passes, you are going to come to love many kids and families and then attend their funerals, you are going to take in your niece and nephew (twice) to live with you because they will need a home, and you are going to sit next to the last person you'd expect, oldest friend you have while she gets chemo." "That is why we don't know the future," echoes in my head. As I walked out of that hospital I realized I can't change all the terrible things that happened in the last three years. I can either live in fear of the unknown based on what has happened, or I can live with the knowledge that no matter what happens God is for me and will work all things for my good. I can either think about all the tremendous loss we have experienced, or I can appreciate all the amazing kids and families we have met and had the privilege to know and love. I can either think about all the people that disappointed me or hurt me during this, or can I be grateful for all the blessings God poured out on our family through the most unexpected people. I can either dwell on the cancer statistics and hide from the pain of pediatric cancer and the suffering surrounded by it, or I can focus on what I can do to help just one family today. I can wonder what CJ and the rest of our family would be like without all these tragedies as part of their life and be terrified of their future, or I can rejoice in who we are because of them. I assume you can imagine which one I am choosing. And I assume you can imagine the consequences of either. Just take a look around you. After the appointment, I drove home with my "normal anyone" sitting next to me who is anything but normal and I rejoiced in his presence next to me. I thought to myself, three years ago, unbeknown to me, it was Childhood Cancer Awareness Month when I walked through the doors of that hospital to discover my own child had cancer. Three yeas later it is once again Childhood Cancer Awareness Month and I am walking out a different person with a different child. I am now extremely aware of the significance of the month, the suffering, the cost, the loss, and the loneliness. But I am more aware of my Savior, my blessings, my faith, my hope, and the ultimate cure to all of this..... Jesus Christ! "For I know the plans I have for you declares the Lord. Plans to prosper you and not harm you, plans to give you hope and a future." The reason I know that Scripture is true is not because CJ is alive and cancer free, we are financially stable, and we have hope for the future in sight. The reason I know it is true is because that statement can be made and is made just as confidentially by my friend Tabitha who just buried her son Nick a couple weeks ago and is struggling with the finances to even purchase a headstone for his grave site. And it is made by so many other amazing moms I know that have buried their children. That is how I know that I know that it is true. I live it and see it lived out every single day by way more amazing people than myself. So my "normal anyone" is doing great. 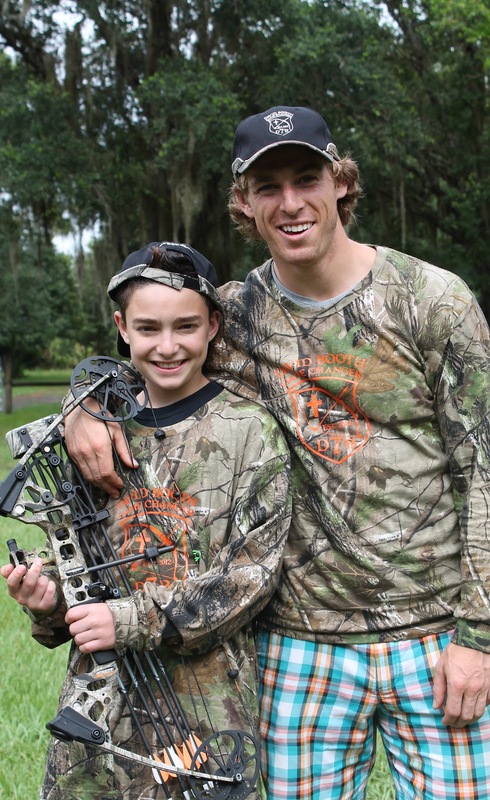 He has become the Ambassador/Spokesperson for the Florida Panthers Foundation which focuses on pediatric cancer. They just released a clip of him on their home page. Be sure to check it out at: http://panthers.nhl.com/club/microhome.htm?location=/PanthersFoundation It is a short clip but worth the peek. He will be speaking at all their signature events beginning with the Gala on October 4th. Last month he shared his story at the corporate headquarters of a Bank to all the Branch Managers. 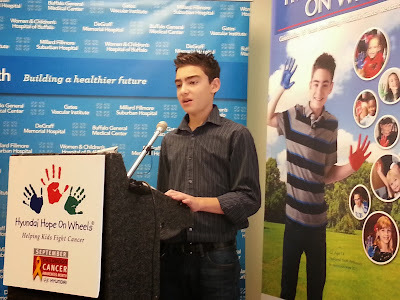 This month he spoke a the Hyundai Hope on Wheels presentation. And next month he will featured as the Make a Wish Child at the Applebees in Hialeah. So much for 'normal anyone'. But those are not the things CJ would want me to share with you. He would want me to tell you that he has his first Hockey game tomorrow. He is extremely excited. We are extremely proud. Seeing him on the ice is amazing after all he's been through. We had quite a surprise when we went to his practice last week and one of the players on his team came up to him and said,"Hey CJ, your picture is on the boards." And sure enough, it was right there on the boards surrounding the ice where the Florida Panthers practice. Even more exciting, he is on the same team with his brother Brett and we know this is going to be a season they will share together and a special brother bonding time they will never forget. Please do not forget that September is Childhood Cancer Awareness Month! These kids deserve the attention and the awareness. It is still so slow in coming and I hope in the coming years we see more progress. Gold is the color for childhood cancer. Gold ribbons for our not so normal someones! It has been a long month. One filled with more loss than most people experience in a lifetime. I don't even know where to begin. After a 22 month battle with cancer, "Poppa Enzo" passed away on Tuesday, August, 16th. During the final days, there was plenty of time for the family and friends to come and say good-bye. CJ stood over his bed two days before he passed and said, "I love you poppa." I hated that he had to see up close and personal what cancer can do physically to a body and know he came close to experiencing that. I won't go into detail about those final days because if I said they were beautiful and peaceful and there was no pain or suffering or questions I would be lying. That's not to say there were not some very precious moments. There were! But if I described it with any honestly at all it would only serve to leave you heartbroken and confused. All in all, it all boils down to this.... regardless of our circumstances and what appears before us, we walk by faith and not by sight! If I walked by sight I can tell you right now I would be devastated. Unbelievably, the week that Enzo passed we lost three cancer kids. THREE! Ethan Jostad, Bo Story, and Abby Smith. All were very young children. I felt so heartbroken and yet so incredibly selfish because I was so thankful that CJ was healthy and playing outside as death hovered over this house and the house of so many precious children. Childhood cancer is beyond devastating. The facts alone would crush you. The reality of it is even worse. Many ask me how we stay so immersed in it? We walk by faith and not by sight. As I sat and held Enzo's hand watching him take his final breaths, I could not help but think of Mackenzie whose little hand I held just 6 months before as she took her final breaths. I could not believe it was only 6 months prior. I felt like I had lived a lifetime in between. I honestly began to wonder if my kids were ready to handle this again. We had Enzo's funeral the following day and I sat there looking at my little 8 year old Brett as he walked over to the coffin, stopped, and began to cry. I remember thinking, Lord, please work all things for good....even this. Even an 8 year old boy standing at his second grandfathers coffin in less than two years. Did I really bury my dad less than two years ago? And now I am burying my step father. I felt like I had lived a lifetime in between. CJ was in the car with his grandma Paula (my mom) the other day just before Enzo passed and they were chatting. My mom told him that when she was his age she had never even known of anyone who died. He just looked at her trying to make sense of that reality and said, "I can't even imagine a life not knowing of cancer and death." He knows so much of it. He's 12. Unfortunately, as much as I would have liked to have shielded him from further loss and say I thought this would be the last for a while, I knew he was about to know more of it. 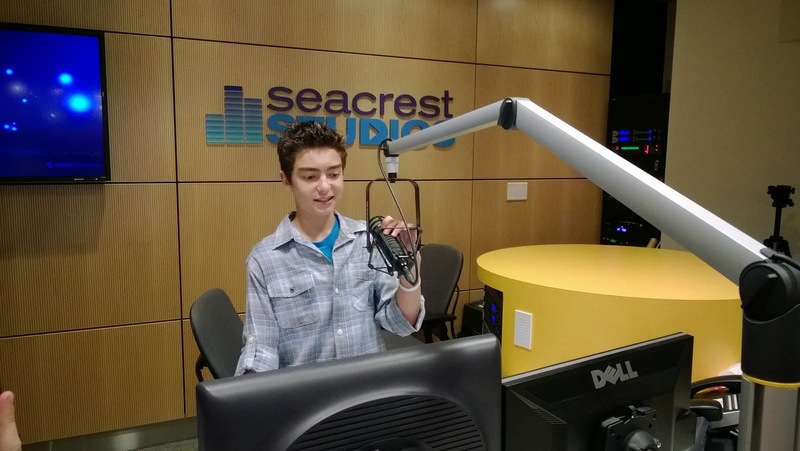 Our sweet friend Nick Patrick, age 15, who was battling cancer was not doing well at the time. I kept praying selfishly that the Lord would wait. We were not ready for another blow. But the Lord's time is set and Nick went to be with Him yesterday morning. I dreaded telling CJ and the rest of the kids. We had just spent a wonderful weekend with Nick and his amazing family a little over a month ago. Was that really only a month ago? I felt like I had lived a lifetime in between. Thank you to everyone who made donations to CBC in memory of Enzo Alibrandi in lieu of sending flowers. It will be a blessing to many families in great need and honors his memory greatly. We spent the past week at the Lighthouse; a Christian retreat for families whose children have been diagnosed with some form of cancer. It was our second year attending this retreat. There were about a dozen cancer families there and even more volunteer families serving. Some were only 2 months into the battle while others were 7 years in and still fighting. Some were still on treatment. Others, like ourselves, were making the transition into life off treatment. Each family is etched on my heart and brain. Ever since I got home I have not been able to stop thinking about them. It has been difficult to transition back into the flow of life. I wish I could give you a glimpse into this retreat. How can I explain that this world of childhood cancer is the most horrific experience and yet most rewarding privilege of my life? The deepest darkness accompanied by the most brilliant light. Does that make sense? Their stories are truly life changing. Dare I share the details? Would you listen? I listened intently as one young mother shared about her battle with breast cancer. She not only lost both her breasts but when it spread to her cervix she lost so much more. Multiple surgeries. To the brink of death and back. As she shared her story, the fear, grief and honesty was so real you could taste it in your own tears and feel in your own heart. I already knew the rest of the story; I just never could have fathomed the beginning. Within months of her own battle, her young daughter was diagnosed with a serious brain tumor that turns out to be cancer. Why Lord? Then there was the family from generations of boys who continued that tradition with the birth of two sons. They prayed and wished and hoped for a precious little girl to bless their masculine and rambunctious world. God delivers. But by two months old she is fighting a serious and aggressive form of cancer that is ravaging her little body and threatening her very femininity. The little pink dresses and ruffles become a source of pain instead of the joy they expected. Really Lord? How about the family whose daughter was diagnosed with an incurable form of cancer. Literally incurable without God's miraculous intervention. A brain tumor attached to her eye. Always lurking. Always threatening. Treatment will never end. They will always have to stay one step ahead of it. That's burden enough. Yet during their daughter's treatment their son is diagnosed with Crohn's disease. Also incurable apart from God's hand. Always lurking. Always threatening. Treatment will never end. For how long Oh Lord? Then there is the beautiful little girl who was born premature. As a result, she was severely brain damaged as an infant. Her little body and young life full of surgeries and challenges. Nothing is easy. Every breath and milestone fought for. Now liver cancer? Help me understand Lord? Should I go on? How about the little boy diagnosed at age two. He is now 9. Three relapses. Still battling. He knows no other life than battling cancer. Neither do his three younger siblings born into this life that they think is normal. These are your people Lord. Servants in the ministry. Even them? Or maybe I can tell you about the 17 year old girl whose body has been so consumed by the caner and the treatments that it is not her own. She has had to surrender it to the treatments to save her life. Her hair, her weight, the scars, her inability to walk well because of the nueropathy. She's 17! Female at 17 while healthy is hard enough- is it not Lord? I know, I will tell you about the one I tried to ignore all week because it hit too close to home. She was one that attended the same retreat with us last year who had just finished two years of treatment and had her port removed. I remember the sense of relief and shaky celebration the family had last year! It was finally over after such a long battle. Sound familiar? Guess why they were back this year....not to celebrate another year cancer free. You celebrate that by NOT coming back. She relapsed shortly after last years retreat and is now back on treatment. Bald again. Fighting. Can you guess why I tried to avoid dissecting that one? Can you guess what my question was for the Lord on that one? Will that be us Lord? Will we be sitting here next year on treatment again. Bald? Fighting? What do you think the doctors told her mom when her daughter had a fever and she feared relapse? "You're just paranoid. It's just a fever. Life is normal now. You need to stop worrying so much" Wrong! It's back to their 'new normal' again. There are more stories but I am afraid your heart would burst if I go on. Then you will end up like me...trying to process it all. How about I just go straight to the elephant in the room all week? Or rather...not in the room? I have never felt someone's absence become a very presence like that before. For the families there that had returned from the previous year, we did not know how long we could avoid the topic. Would it upset the new families? Could we even handle it? She was a whisper of the heart at first. Then she was a tear shed from a memory. Then she was the lump in our throats. She is a silent fear we all carry. Vibrant and full of life last year but glaringly absent this year........Mackenzie. Dare we look around the room and wonder if one of these children will be the absent-presence next year? I could not help but think....what if they are all gathered here next year without us? Would they mention CJ's name or would he become the silent pain they all carried? There was Creed. Creed, who coded twice this past year. Creed, who not only went beyond the brink of death and back but firmly into its clutches....twice! Creed, who should be brain damaged...but isn't. Creed, who jumped on stage and sang, "Glory to God Forever" at the top of his lungs while pumping his little fists in the air. When he sings the lyrics... "take my life, let it be, all for You and for Your glory. Take my life, let it be Yours" you better believe he knows exactly what he is saying and sacrificing. He's 6 folks. He exudes Light. We watched couples go from the brink of divorce on day one to the commitment to take that word out of their vocabulary by day five. We watched people lay bitterness and resentment down for their loved ones who just could not "be there" or weren't equipped to support them during their battle. We saw forgiveness flow for those who abandoned them at their neediest time. We witnessed parents turn the outcome of their child's battle over to the Lord and realize they are not the ones in control no matter how hard they try. We watched as husbands actively sought how to better support their wives through this trial. We listened as a couple shared about a restored marriage. We saw people become more interested in God's glory than their comfort. We witnessed people discover they were not alone, never alone. From darkness into marvelous Light. And that is just the cancer families. I have not even mentioned the ones that blow me away even more. Yes! Even more brilliant are the families spending the week serving our families. Talk about Light! Who do you think watched our kids while we had those sessions? Want to pay your own money to spend your own week's vacation serving a bunch of cancer families. Want to get your heart attached to someone you may have to lose? Want to have to stare suffering in the face? Want to cook for 150 families? How about clean up after them? Want to lay your life down for your friends? How about strangers? You want to know Light. Meet my amazing friend Cheryl who suppressed her own broken heart over the loss of Kenzie and came to the Lighthouse knowing she would once again be opening herself up to the possibility of more pain. I could see the caution written all over her face. But when you have that deep of a servants heart it is impossible to stay away. She came, she served. She reflects Light like I have never seen before. Just in case you missed it, I am going to end this post with the most amazing story. I still can't really believe it myself. Get ready because this one is really unconventional. This one challenges me and so help me God...it will change me as well! Each family is assigned a family partner. These are the people I told you about that pay to come spend their own personal time off work or school to serve our families. They cook, clean, wash, play with our kids, give piggy back rides, do silly talent shows, make our beds, wash our clothes, carry our luggage. Should I go on or do you get the point? Sometimes it is a family assigned to each cancer family just like we had last year. However, this year we had a single woman along with some of her youth volunteers from her church small group that she leads. So she was not only serving our family but also serving and caring for them I expect as well. I met her last year at the retreat and have kept in touch sporadically throughout the year. This year she was back again and we were pleasantly surprised to see a familiar face assigned to our family. Her name is Angie, but it is definitely misspelled. It should be Angel. You see, I found out on day three from another friend that just a couple months before the retreat Angie was diagnosed with Stage 4 breast cancer that has metastasized to her lymph nodes, spine and hip. Did you catch that? Stage 4 metastatic breast cancer. You think there was time to back out? You think everyone would completely understand? You bet! But not Angie! For her, there was just enough time to accept the diagnosis, get a port installed and start some hormone therapy to prepare for her upcoming chemo, radiation and surgery just before heading out to serve at a pediatric cancer retreat. And she is assigned to my family of 7! Guess who carried my 50 pound niece around on her back all week in 90 degree weather? Guess who made my family's beds all week? Guess who did my family's laundry? Guess who carried my luggage? Guess who played with my kids so I could relax? Guess who left me encouraging notes in my room each night assuring me of Gods love and care for me? Guess whose laughter I heard the loudest each day over the kids? Guess who reflected more Light to me than I have ever seen? "You, LORD, are my lamp; the LORD turns my darkness into light." Angie in the front center with my Allie in green and more girls! That's Jim again. He doubles as a playmate for my boys when he is not cooking. Brett gets the first kill! We welcome any and all new readers and friends. Please see the profile or scroll all the way to the bottom for a brief introduction to our family and CJ. Otherwise,enjoy the updates as we post them. Thank you for your prayers and support! Please take a moment to check out the 501(c)3 non-profit organization Children Battling Cancer, Inc. we have started to assist families dealing with childhood cancer. We have events for the families of childhood cancer and events for the community to raise awareness and support for these families. We miss you both! God please heal this little boy! Receiving a Thanksgiving Box from Holy Cross Lutheran Church. Breaking the rules....his feet were off the ground. It 's a beautiful medal and we will treasure it forever! Michelle Barnhart ran in the 33rd Marine Corps marathon in Washington D.C. in honor of CJ and to benefit the Lymphoma Society. She wore a picture of CJ pinned to her shirt. She sent the beautiful finishers medal to CJ. He received it during his first blood transfusion. It is beautiful! Thank you! waiting for his spinal tap. where Your love poured out. How a man carves a pumpkin! Lotsy dressed as a patient! Mickey accessing CJ's port! Strange! baby brother Corey watching closely! Can't wait to drive my cart again! Thank you for the cool Hat! a new form of homeschooling! "don't count, just do it..." he said. Thanks for the great basket! CJ's bag of presents...he's sneaky! CJ, we love you, and we want you to know that we been praying for you. Even though this must be hard, God is right there on your side. And He still cares for you. CJ, don't be afraid. God will pull you through every single trial. It might not seem like He's there, or maybe He doesn't care. But thats not true! CJ, God loves you, He loves you so very much. He sent his son to die for you, to conquer all of your fears Please don't forget, oh, don't forget that God is faithful. We hope you feel better soon, yes we do. CJ WE LOVE YOU!!!! Uncle Bob gives CJ his collectors hat! CJ, We love you and are extremely proud of you and how you have handled this fight. We will be here by your side every step of the way. We are a family of 6 who live in Miami, Florida. 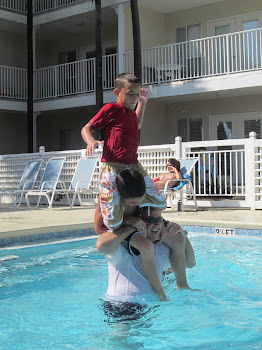 Chris is a police Sergeant with Miami-Dade County and I homeschool our 4 children. This blog originally started as a family blog with pictures and articles and a place to post some of the kids writings and for me to share my thoughts. Then, in September 2008, our 9 year old son who we call CJ, was unexpectedly diagnosed with stage 3 Acute Lymphoblastic Lymphoma. Needles to say, our world was instantly changed. This blog became a lifeline to our family and friends, a cry for prayer from anyone willing, and a journal of our life day by day as we walk through some of the most difficult moments of our lives determined to never take our eyes off God believing He will never take His eyes off of us. God has lead us to lay our lives bare before Him and all of you and share our day to day battles including the struggles and the joys openly and honestly. Although this can be very painful at times, CJ's story has affected many lives so we press on. Our hope is in Christ and His power. We are watching Him perform a miracle in and through this young boy. Through the archive you can read CJ's story as it progressed from diagnosis through chemotherapy from week to week. Come and laugh with us, cry with us, beg God for mercy with us and rejoice with us in His faithfulness. Please lock arms with us in prayer for our son's healing. May not one moment of his fight with cancer be wasted. May God be glorified in and through this battle. To Him be all the praise and honor and glory, forevermore.